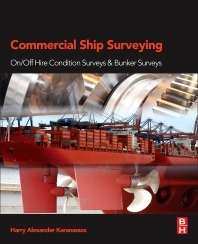 Commercial Ship Surveying: On/Off Hire Condition Surveys and Bunker Surveys provides guidance on the complete survey process, what should be done to prepare, and what constitutes good practice, all completely detailed so that the process can be executed quickly and efficiently. In addition to the surveying process, the book describes supplementary topics, such as the vessels likely encountered, the gear and rigging involved, and the special techniques necessary. The book is well-researched, with plenty of practical examples and photographic references, explaining not only what is expected to happen during surveys, but also how marine surveyors and ships’ officers are expected to perform, if, and when, they become involved with this work. Dedicated to detail, this book ensures that the reader clearly understands each step of the surveying process. 5.7 Coating Breakdown and Corrosion. Mr. Karanassos is a European Engineer (an international professional qualification for engineers used in over 32 European countries), a Naval Architect, and a Chartered Engineer. He has spent over 39 years surveying ships and managing marine operations as a Marine Superintendent and Chief Marine Superintendent. He is also a Fellow of the Royal Institution of Naval Architects, UK, and currently serves as a member of its Council.